Most people believe that their home is mainly made up of a few things like: doors, windows and walls. They tend to live in the living space without ever realizing the possible damages that cold winter nights and some storms with 70-80 mph winds may cause. The roof of a house is an important portion that takes most of the hits coming from outside the home. It keeps our homes dry, safe and warm. If you have any roof related problems, please do not wait till it causes major damage to your home to get it repaired or reinstalled. 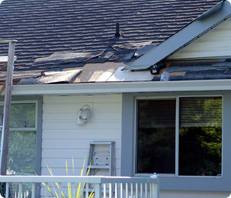 We can help you with all minor or major roof repairs or reinstallation, so give us a call.